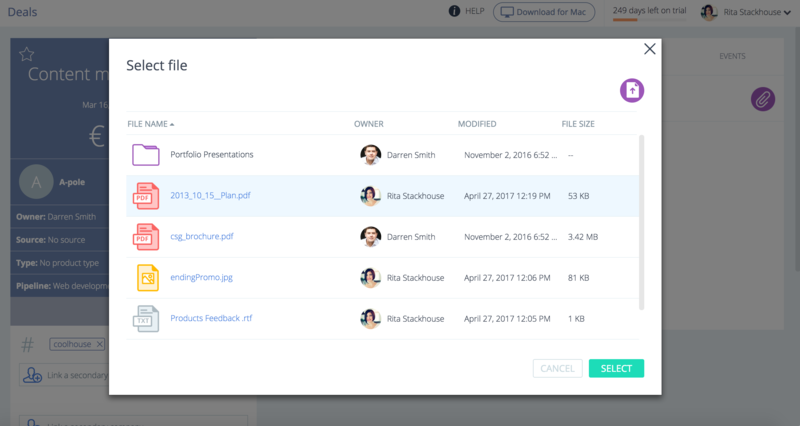 You can now upload files directly to Sellf using our dedicated Files Section (no need to use Dropbox or Google Drive!). You can for example easily decide to share documents like catalogs with all your collaborators from within Sellf. The storage starts from 2 GB per user and goes up to 50 GB. This feature is available for plan Starter and above. More info on Sellf Plans are available here. 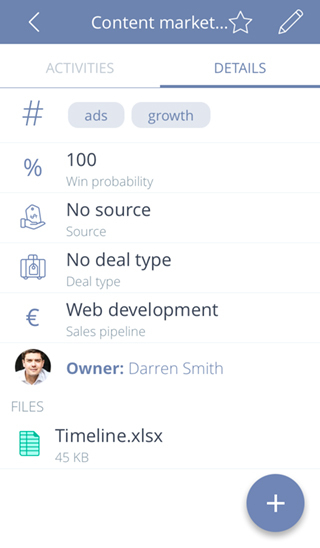 Files and folders can be uploaded on Sellf Web by each user in the team and can be visualized on mobile apps when linked to deals and people/companies. 1. Sign into Sellf web (www.sellf.io) and navigate to "Files". This is where you'll find and upload your documents. You can create new folders and upload documents by clicking on the two icons at the upper right of the screen. 2. Here you can use the classic file-picker window to select your files to upload or you can drag-and-drop your files. If you need to upload several files, you can select or drag all of them at once. 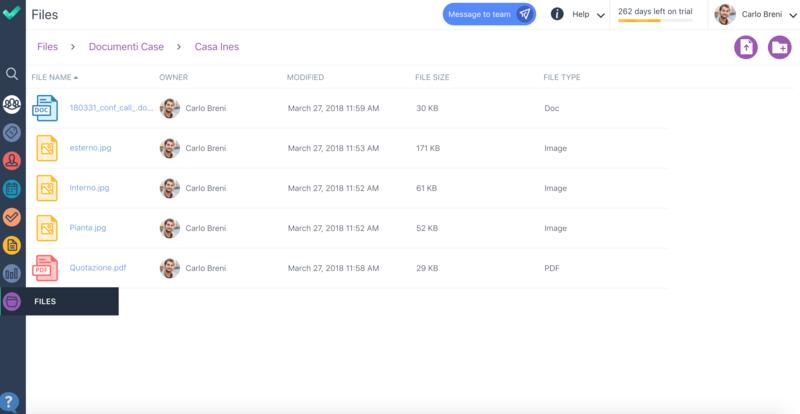 Once your files have been uploaded, they'll appear listed into the File section and you can sort them by Name, Owner, Modified, File Size, File Type, just click on the labels. 3. 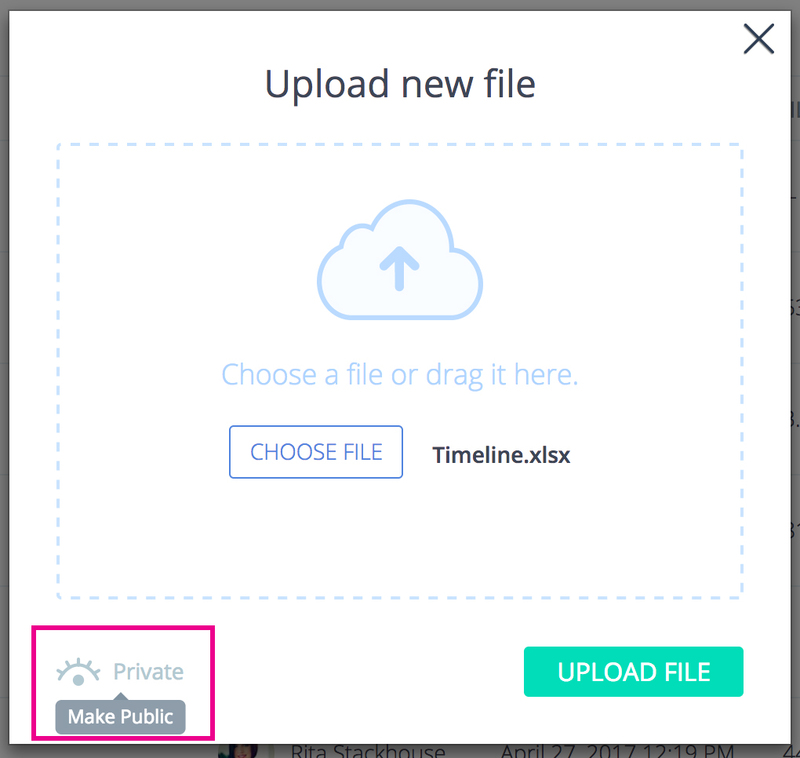 Before uploading your files, you can decide to share them with all team members, making them public. Hover the mouse on the "eye icon" and click on it to make the file "public", as you can see from the screen below. 4. Files uploaded can be attached to any deal or contact. Navigate to the deal or contact page and click on the tab "Files", then click on the "paper clip" icon on the upper right of the screen. You'll be prompted to select your files from the full documents list, but you can also upload new files, then click on "Select". Files attached to deals and contacts will be also available on mobile apps (Android and iOS). You can always download and unlink files from deals or contacts: hover your mouse over the file and click on "Unlink" or "Download". Files uploaded in the File Section don't follow the Team multilevel permissions. They can be private or public. If a file is public, it will be visible to all team members, otherwise it will be visible only to its owner. Remember that public files may be attached to a deal/contact, downloaded from a deal/contact. Note: if private files are uploaded and linked to a contact card or a deal card, they will be visibile to the team, according to Team multilevel permissions. To edit file permissions, simply hover your mouse over the file; a series icons will appear to the right of the document: if the eye icon is purple, the file is public. Click on the eye icon to make it private or viceversa, click again to make it public. Owners can rename and delete their files, by clicking on the pencil icon or the trashcan icon. Files uploaded by other team members can only be visualized and downloaded. To open the file, click on its name. To download files individually hover your mouse over the file in the documents section. An arrow icon will appear. Click on it to download your file. To delete files individually, hover your mouse over the file in the File section. A trashcan icon will appear to the right of the document, click it to delete the file. You'll be prompted to confirm your choice. Remember that only the owner of each file (the user who uploaded the file) can delete it. You can upload photos to Sellf directly from your smartphone. Photos can be linked to deals, People or Companies. For example you could take photos of your customer's identity cards and upload them to Sellf, in order to have data at hand, without having to scroll the long list of your smartphone gallery. 1. Choose a Contact or a Deal card, tap the "+" button at the bottom right of the screen. 2. Here choose the "File" icon that opens a new dialog from which you can select and link files from your File section. 3. To upload a new photo, just tap the "+" button at the bottom right of this screen and choose between "Take photo" to take a new picture with the camera or "Choose photo" to choose from your gallery. Photos can be unliked from Deals and Contacts by clicking on the "X" icon, but you have to remove them from Sellf Web in order to delete them permanently from your File section. You can't upload new photos when you're offline. There are no limits to the size of the files you can upload to Sellf, as long as it falls within your subscription plan's storage allotment. The Starter Plan allows you to store up to 2 GB/user. The Performance Plan allows you to store up to 5 GB/user. The Enterprise Plan allows you to store up to 50 GB/user.